There are no aliens at America’s most famous top-secret military base, but what is there is just as interesting. The beginning of Area 51 is directly related to the development of the U-2 reconnaissance aircraft. After World War II, the Soviet Union lowered the Iron Curtain around themselves and the rest of the Eastern bloc, creating a near intelligence blackout to the rest of the world. When the Soviets backed North Korea’s invasion of South Korea in June 1950, it became increasingly clear that the Kremlin would aggressively expand its influence. America worried about the USSR’s technology, intentions, and ability to launch a surprise attack—only a decade removed from the Japanese attack on Pearl Harbor. U-2 testing began in July 1955, and immediately reports came flooding in about unidentified flying object sightings. If you read the details in a 1992 CIA report that was declassified with redactions in 1998 (and subsequently released nearly in full in 2013), it’s easy to see why. Many of these sightings were observed by commercial airline pilots who had never seen an aircraft fly at such high altitudes as the U-2. Whereas today’s airliners can soar as high as 45,000 feet, in the mid-1950s airlines flew at altitudes between 10,000 and 20,000 feet. Known military aircraft could get to 40,000 feet, and some believed manned flight couldn’t go any higher than that. The U-2, flying at altitudes in excess of 60,000 feet, would’ve looked completely alien. Naturally, Air Force officials knew the majority of these unexplained sightings were U-2 tests, but they were not allowed to reveal these details to the public. So, “natural phenomena” or “high-altitude weather research” became go-to explanations for UFO sightings, including in 1960 when Gary Powers’ U-2 was shot down over Russia. What’s also interesting about the most recent 2013 report is that it confirms Area 51’s existence. While the 1998 version does have significant redactions when referencing the name and location of the U-2 test site, the nearly un-redacted version from 2013 reveals much more, including multiple references to Area 51, Groom Lake, and even a map of the area. U-2 operations halted in the late 1950s, but other top secret military aircrafts continued tests at Area 51. Over the years, the A-12 and numerous stealth aircrafts like Bird of Prey, F-117A, and TACIT BLUE have all been developed and tested in the Nevada desert. More declassified documents reveal Area 51’s role in “Project Have Doughnut,”a 1970s attempt to study covertly obtained Soviet MiGs. Even so, the alien conspiracies gained ground in 1989 when Bob Lazar claimed in an interview on Las Vegas local news that he’d seen aliens and had helped to reverse-engineer alien spacecrafts while working at the base. Many have disregarded this as fiction and are even offended at the notion, including Merlin, who has spent years talking with former Area 51 engineers and employees angered by all the fuss about E.T. 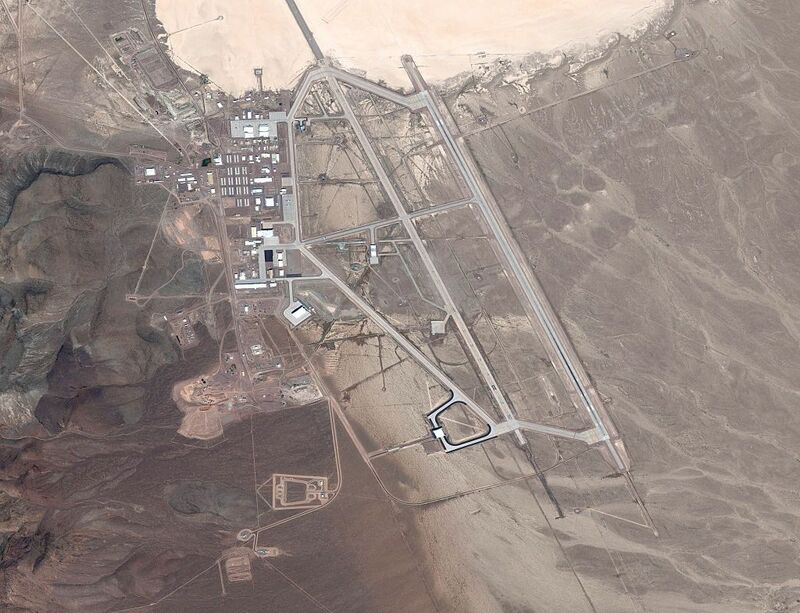 Today, Area 51 is still very much in use. According to Google Earth, new construction and expansions are continuously happening. On most early mornings, eagle-eyed visitors can spot strange lights in the sky moving up and down. No, it’s not a UFO. It’s actually the semi-secret contract commuter airline using the call-sign “Janet” that transports workers from Las Vegas’s McCarran Airport to the base. As for what’s happening these days in America’s most secretive military base, few know for sure. Merlin has some educated guesses, including improved stealth technology, advanced weapons, electronic warfare systems and, in particular, unmanned aerial vehicles. Chris Pocock, noted U-2 historian and author of several books about the matter, told Popular Mechanics he thinks classified aircraft, more exotic forms of radio communication, directed energy weapons, and lasers are currently under development at the base. Fact or fiction, aliens are a big tourism draw. In 1996, the state of Nevada renamedRoute 375 as the “Extraterrestrial Highway,” and destinations such as the Alien Research Center and the Little A’Le’Inn (in the town of Rachel with a population around 54) dot the road. To Area 51’s west, there’s the Alien Cathouse which is advertised as the only alien-themed brothel in the world. Geocaching also attracts visitors here since the highway is considered a “mega-trial” with over 2,000 geocaches hidden in the area. Then there’s the actual base. While getting inside is not in the cards for most, curious civilians can actually drive up to front and back gates. Locals will direct you, and the website Dreamland Resort is a great resource full of maps, driving directions, and first-hand accounts. However, one should be careful when planning a trek to Area 51. It’s the desert, after all, so bring plenty of water, snacks, and have proper weather gear—for the hot days and the cold nights. Phone service and GPS probably won’t work, so have printouts and actual maps. Gas stations are few and far in between, so carry spare fuel and tires.